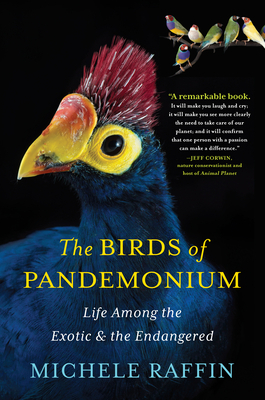 Michele Raffin is president of Pandemonium Aviaries, a conservation organization dedicated to saving birds. A former high-tech executive, Raffin began taking in abandoned and discarded birds fifteen years ago, housing them in her backyard a half hour south of San Francisco. Today Pandemonium is still in Raffin's backyard, but it is now one of the premier facilities breeding and caring for avian species facing extinction due to the destruction of their natural habitats. The aviary has the largest population of rare green-naped pheasant pigeons under conservation in the world and the second largest population of the endangered Victoria crowned pigeons. Raffin, who also lives with turacos, lorikeets, East African cranes, finches, and doves (as well as parrots, donkeys, goats, two dogs, and one cat!) is a dedicated avian advocate and a passionate observer of birdlife, and in The Birds of Pandemonium her enthusiasm for and special relationship with these winged creatures comes through radiantly. A certified aviculturist and regular consultant to zoos and breeders, Raffin has spoken at the TEDx conference, is the conservation columnist for the Avicultural Society of America's Avicultural Bulletin, and has served as cochair of a large humane society and on the board of a companion bird rescue organization. And on a completely different note, Raffin won a gold medal at the 2011 Pan American Olympic Weight Lifting Championship and holds the Pan American Masters record.